As we get deeper into winter in the Pacific Northwest our climate changes into one that is highly wet and cool. In these conditions one of the major problems that winter growers face is humidity; the humidity levels especially in an aquaponics system is of major concern since the system is filled with a vast amount of flowing water. Plants can suffer from various growth problems due to high levels of humidity in their surroundings. Here I explain how humidity can cause a problem in the different growth stages of plants and what can be done to deal with it. Humidity is an expression of the amount of water vapour in air. It is an invisible gas that varies between 1 – 4% of our atmosphere by volume. The maximum amount of water vapour in any given air sample is dependent on the temperature and to a lesser extent the air pressure. The actual amount of water vapour present is also determined by the availability of free water to evaporate. Water vapour will always move from an area of high concentration (such as inside the leaf cavities) to an area of lower concentration (the greenhouse air). This is the principle behind evaporative transpiration or sweating in plants. There are three main measurements of humidity: absolute, relative and specific humidity. Absolute humidity is the water content of air. Relative humidity, expressed as a percent, measures the current absolute humidity relative to the maximum for that specific air temperature. Specific humidity is a ratio of the water vapor content of the mixture to the total air content on a mass basis that is mass of water vapour in a unit mass of moist air, usually expressed as grams of vapour per kilogram of air. However, relative humidity (RH) is the most relevant parameter to understand when it comes to managing the moisture level in your aquaponics greenhouse. The absolute amount of water that can be held by air is relative to the temperature. Since humidity is constantly fluctuating with temperature, relative humidity is a handy way of describing the ratio of water vapour compared to the total amount of water that could be held in the air at saturation at that particular temperature. For example, 50% relative humidity indicates that the air has half the water vapour that it could hold if it were completely saturated. As the air temperature rises, more water vapour can be held in a given amount of air. And as the air becomes warmer, more moisture must be added to the air to maintain the same relative humidity. Relative humidity is an important parameter when understanding humidity levels in an aquaponics system; however it provides an incomplete picture when the objective is to successfully manage humidity in a greenhouse setting. Vapour pressure deficit or VPD is a more appropriate parameter that can help growers better manage humidity related challenges. As implied by the word “deficit” VPD refers to the difference between the theoretical pressure exerted by the water vapor held in saturated air (100% RH at a given temperature) and the pressure exerted by the water vapor that is actually held in the air being measured at the same given temperature.? 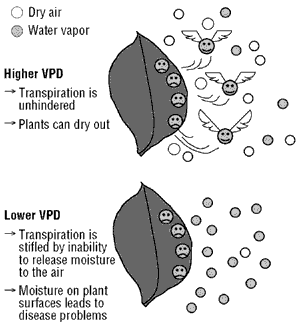 From a plant’s perspective the VPD is the difference between the vapor pressure inside the leaf compared to the vapor pressure of the air in its surrounding. If we look at it with an RH hat on; the water in the leaf and the water and air mixture leaving the stomata is more often than not completely saturated -100% RH. If the air outside the leaf is less than 100% RH there is potential for water vapor to enter the air because gasses and liquids like to move from areas of high concentration, in this example the leaf, into areas of lower concentration, the air. Plants respond to the difference between humidity levels at the leaf stomata and the humidity levels of the surrounding air. At the same relative humidity levels, but at different temperatures, the transpiration demand for water from the leaves may be double. So, in terms of growing plants, the VPD can be thought of as the shortage of vapor pressure in the air compared to within the leaf itself. The main plant mechanism for coping with humidity is the adjustment of the leaf stomata. Stomata open and close in response to vapour pressure deficit, opening wider as humidity increases. When humidity levels drop to about 8 grams/m3 (12 mb VPD) the stomata apertures on most plants close to about 50% to help guard against wilting. This also reduces the exchange of C02, thereby affecting photosynthesis. The air/water vapour mixture leaving the leaf stomata is always assumed to be at saturation. Consequently, it is the VPD of the surrounding greenhouse air compared to the leaf surface that causes water to evaporate. The greater the VPD, the greater the evaporative demand. 1. Measure the leaf temperature and look up the vapour pressure at 100% RH in the first table below. 2. Measure the air temperature and relative humidity and look up the nearest vapour pressure figure. ctive dehumidification. VPD’s over 12.5 (shaded area at the bottom right) will trigger humidification devices such as fog systems. Notice that relative humidity alone is not a good indicator of the vapour pressure stress on plants. ASHRAE Handbook Fundamentals. 1993. American Society of Heating, Refrigerating and Air Conditioning Engineers, Atlanta, GA.
ASAE Fundamentals. EP406.2 American Society of Agricultural Engineering, St. Joseph, MI.